Wow, I hope I look like that when I’m her age. They both look so elegant and she looks so fashionable. It’s nice to see that rules can be broken and that’s she dresses for herself. Probably one of my favorite pictures!! yes, yes and yes!!! I agree with every word you said! They both look so great. And I love the way she looks. She combines colours and forms in a great way so they make an individual style that perfectly fits her personality. What a great look. I love her necklace and her shoes and her smile. And him. And absolutely everything about this. She just looks so young somehow. Gorgeous! The epitome of stylish Italians! Cool. They have character, and senses of humour, too. Gorgeous elegance – bravo Carla! Great shot! Outstanding clothes and style. Thanks, Scott. I love these two.. Still stylish and elegant at their ripe young age.. Priceless photo. Their ensembles work perfectly together! I just adore this pair, and particularly love Carla’s white shirt (it’s perfection with the skirt). The hair ribbon is a great and quirky touch. These people are so elegant, a natural elegance and it’s so enjoyable to watch. I really like the lady’s look. You have a veritable flair for tracking down people with a real presence. This is the clever eye of the photographer that reveals the deeper feelings and truth of a strong personality. this is such a cute couple, they both look so happy. Oh my goodness! They are so stylish and classic. I love her look! From her ponytail to her fantastically chic sandals. They are seriously gorgeous!! I really needed this picture. I hope I can be this classy when I get to be that age. I adore these two, match made in heaven, how blessed are they to have each other? What a sweet photo – I really love this. 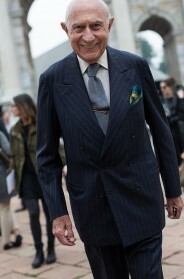 The Milano Fashion/Style A list crowd is fantastically represented on the Sartorialist this week. You weren’t kidding , Scott ,when you mentioned the ‘pearls’ you had in store for us. Wow! My God, without Beppe and Carla, Art/Fashion/Style as we know it would not exist! They continue to rule fashion/art empires, dynstanies, and are also busy contributing to the future of fashion/style. And, as always, their elegant personal styles are perfection, suit them to a T, and are totally hip! Also doesn’t hurt that they are both adorable! These latest photos with old/older tags (wish there were better sounding tags perhaps ‘seasoned”….oh hell let’s not go there after the curve fiasco…They are simply an Older brilliant woman and man, who did much to create the entire fashion and art world we know and enjoy today…and thank god they have no intention of slowing down….or personally ever being anything but stylish! All of these killer photos of the older crowd are now my official go to reference /look book) for my styling clients, and I suspect many a challenged older soul looking for inspiration! so cute! i love her outfit! They are perfect. Especially her, but I also love how happy he is that they’re being photographed… Love it. How lovely to see such a stylish older couple! Lovely couple! and i love her style – very refreshing & youthful-looking :) love the shoes too! fashion knows no age, thats the beauty of it. Does Carla really deserve an “older women” tag? She looks pretty young to me! Ageless is a great look, how happy they are! I would love to know who made her sandals. I want to grow old with my sense of style completely intact like her. I think I’ve seen him maybe in your book? Aside their elegance and style what I like most is the expression of joyful peace (I’m brazilian and I don’t know if it really means what I want to say) on their faces. Oh, and I would love to know about her beautiful neckless. Wow! She is lovely, sassy, and wonderful!! He’s not too bad either! The photo is fantastic.. love her necklace! Such an inspiration! They look so happy, stylish and comfortable in their clothes. Ageless style! Love her dress/jacket. OMG! I wish I could be as chic as this lady when I am her age! Love that blouse and necklace…. she looks like a twinkling star. Oh how I love this photo. Thank you so much Scott for posting pictures of “older” people. They have a certain ease about them that most young waif-y models have yet to achieve. Thank you again for this and the Lucinda Chambers one, they totally made my week. I even printed them out to pin on my moodboard at home. P.S. I love that you are commenting on photos nowadays. While your photos are more than capable of standing on their own, it is nice to “hear your voice” too. She looks beautiful and chic! The people of Milan are true to their passion for style. It’s not just about the models on runways clothed in fab wardrobes. Fashion seems to be a way of life. They are telling us one of those TRUE LOVE -stories…. See, it works… True love exists…. This photo made me smile, too! Elegant and classy as only Italians can be! I have respect to be higher, but I guess by going to the latest in fashion….great photo.Congrats. Thanks, Scott! More older couples!!!! 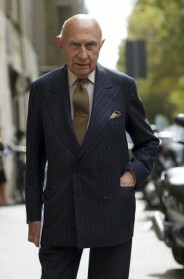 Thank you again dear Sartorialist for reminding us constantly that style has no age. I love the style of those two!!! And most of all their happy faces! Lovely couple.. this pic is so sweet! That shirt is very interesting, is an unusual length! When i will be old, i want to be like her! Lovely! I love the attention to detail in their outfits. The gent’s hankerchief makes the outfit look ultra classy and the lady’s necklace is so elegant! They both look absolutely beautiful. Blimey, she just makes everything tick. She is sunshine personified. I love their look! I can only wish I am so fashionable when I’m their age! they look so happy and stylish..
but his pants are way too long. They look fabulous and so happy. They must have been enjoying the ride to the fullest! That’s it. I’m going silver (reference to Garance’s worries about 10 non dark hairs on her head). Great happy pic, love it. Scott-think you need to change ‘older women’ to ‘women of a certain age’ or ‘timeless women’ or something….. You might as well be calling us ‘geezers’. My fascination with Marni style alive! Meanwhile belongs Marni to the classic of fashion. This’s how wonderfully harmonizes in the company of traditional look. 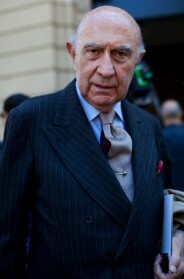 Beppe is always amazingly perfect in his timeless elegance. I love this couple …. not saving their Sunday best for a special day… every day is special and they are living it. Thanks–I very much appreciate the series on older people. I think these are some of your best and most interesting shots. I want to be them when I grow up :). Sophistication and happiness like this makes being 50-60 seem infinitely preferable to being 20! Her eye for proportion is just unmatched. Especially love the long, black ties left hanging from her divine necklace…! Doesn’t she look like Franca Sozzani? the shoe laces in the hair might have been enough. Dapper he & stylishly chic she, are infinitely inspiring & utterly charming! This gives me hope & makes my day. The pair of shoes the lady is wearing are my favorities! I think they are azzedine alaia’ ones. looove it! Elegant, cool and all style – quite the duo! Obviously style has nothing to do with age! Best proof! I agree with one of the comments that I want to be them when I grow up.. I hope they can let each other in, to the other, and it looks like they have that ability as a couple.. These two amazingly stylish individuals are inspiring and refreshing. Can you please remove the distasteful ‘tags’. I know that you, of all people, wouldn’t intend anything derogatory, but seeing those words associated with Carla and Beppi feels insulting. They are ahead of ‘the pack’ and their sense of style is so individual, especially Carla. She is absolutely magnificent. The ‘Dynamic Duo’. I find it funny that people say they want to be like this couple (or, more commonly, like this woman) when they are old. I want to be like them, now. It just goes to show that you can be current and stylish at any age. They look great! I believe that is Carla Sozzani, Franca’s twin sister, which is why she looks like her. She is magnificent. THANK you for publishing images of beautiful BEAUTIFUL people who are not in their 20′s. I love the Kris Ruhs necklace ! I can’t figure out why, but just looking at this photo fills me with joy. I don’t get the problem with calling Carla Sozzani an older woman. According to wikipedia, she is 64 years old. This is a bit like complaining about calling a 7 year old a child or a little girl. If we are lucky we will all go through the various stages of life, and I for one hope to be like Carla and be a chic older woman. Now if the point is that Scott doesn’t have tags for younger women, meaning that they’re the norm for the stylish so he has to tag the elderly because they’re not the norm for stylishness, I get that and think it’s a valid criticism. Carla’s style is amazing!! Hope my style develops in such amazing ways. No need for designers to tell her how to dress. Utterly beautiful. I am an “older woman” age 59 and I do NOT see anything distasteful about the tag “older”. Given: we all get “older”. It’s a fact and NOT a bad thing or an insulting thing. It’s more desirable to become older than it is to be dead at age 30. Growing old is part of life and it’s a beautiful thing. And please post more pictures of older men and women. As a middle aged woman, I pray to the great fashion god in the sky that I get to be an even older woman. My style has matured – it will get even better, and my life is ten times more thrilling. The young have their own advantages, but years and years of learning how to dress – and live – is the blessing of advancing time. They make me smile from ear to ear. What a stylish, happy couple. I agree with PinonHillsDebbie – the tag “older woman” is to be celebrated and embraced. I don’t see any negative connotation attached to it at all. Thanks for making me smile so much with this one! Oh to be a Sozzani! Dictionaries could use the word Sozzani as a synonym for effortlessly stylish. I don’t find the tag “older woman” discrimatory, but I do find the comments implying that it is really surprising to find stylish, beautiful older women offensive, particularly when Carla Sozzani is one of the world’s style arbitrators. Scott, please continue to add more photos under the “older woman”tag. As a 63 year old, it is nice to know you are providing a growing resource of inspiration for my age group. This goes to show you can be stylish at any age! Kodiboutique.com has great timeless pieces… Check it out! So nice to see couples that have matching style and class!! Great picture!!! There are no age boundries in fashion,that’s for sure! 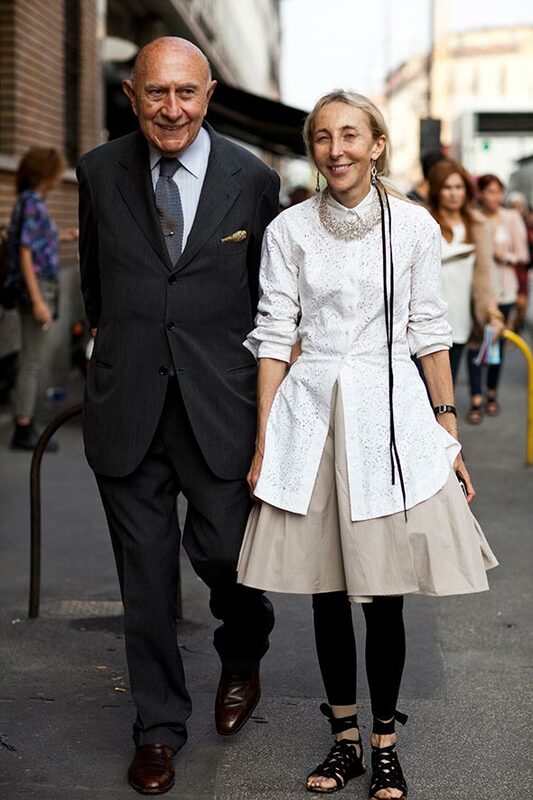 I wish I will grow very old and stylish with my boyfriend! WOW! BIG fan of this, I love how she looks so stylish but without looking like mutton dressed as lamb. Carla and Beppe are beatifull! Very cool!!! I love de “older man” and “older woman” tags. I am 53 years old. I am more happy now!!! This is a photo of friends. Carla’s partner for many years is Kris Ruhs, a brilliant, American artist who also designs most of her jewelry. In fact, he contributes designs to many of Carla’s projects including the decor for 10 Corso Como. His paintings, and installations are wonderful too.